Despite the drop in HDD unit shipments, both sequentially and year-over-year, total capacities shipped by the two leading makers of hard drives increased in Q1. 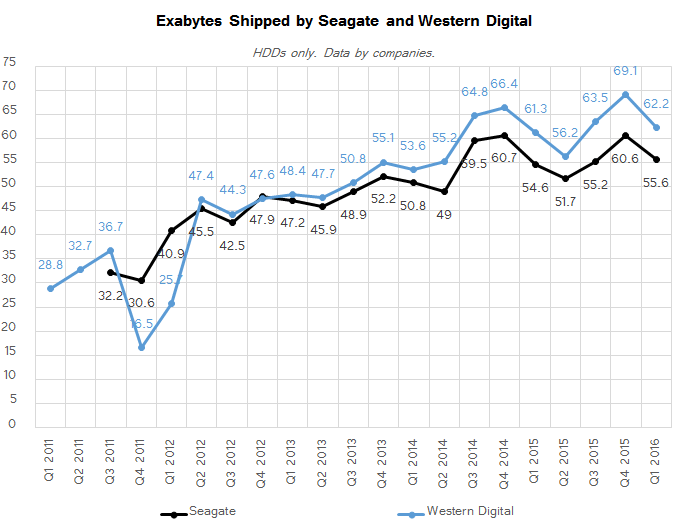 Seagate supplied 55.6 EB (Exabyte) of HDD storage last quarter, up from 54.6 EB in Q1 2015, but down from 60.6 EB in the previous quarter. The total capacity of Western Digital’s HDDs shipped in the first quarter of 2016 was approximately 62.2 EB, a moderate increase from 61.3 EB in Q1 2015. When it comes to hard drives, one thing that has been growing quarter-over-quarter for a long time now is average HDD capacity, particularly in the enterprise segment, but not only there. In Q1 2016, an average drive could store around 1.4 TB of data, an increase of 28.5% (Western Digital) and 29.7% (Seagate) from the same quarter last year. 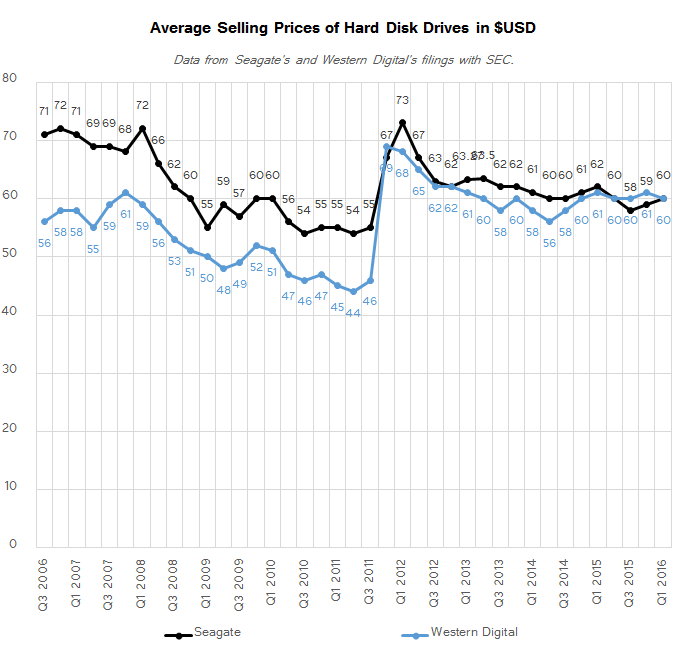 Despite the local price hikes by HDD makers, the industry can clearly produce more hard drives than it can consume, which is why prices of mass HDD models remain rather low. This will likely change in the future, when consumers shift to higher-capacity drives because of 4K UHD video or other reasons, but right now an average HDD from either Seagate of Western Digital costs approximately $60. This will likely change after Seagate implements its plans to cut down its manufacturing capacities and supply-demand balance of the market will stabilize. However, it remains to be seen how significantly that is going to change going forward.